The position line is a line on the surface on the earth which you can use to determine the location of a vessel. On a position line the ranges, bearings and distance can be found. Range is when two landmarks form a line, for example when a lighthouse is aligned with a mountaintop or a hill. Two ranges give a fairly reliable position fix and should be used whenever there is a change. 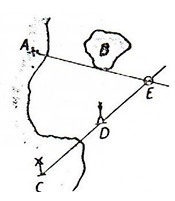 Example of two ranges is shown on the image: the church A is aligned with the south end of the island B and the mill C is aligned with the buoy D. The intersection E is the location of the vessel. Range and bearing are not as good position fix as two ranges, but are nevertheless pretty good, if the bearing is taken on an object which is not too far away. On this image we can see that the mill A is aligned with the church B and at the same time the bearing of the cape C can be taken on the compass. D shows where the position lines intersect and shows the location of the vessel. Two bearings, also called a cross bearing, is the most used of all position fixes even though it is not particularly accurate. It is convenient in the way that you only need two points to determine to location of the vessel. They do not have to lie in any specific way; the only requirement is that the angle between the two bearings cannot be too narrow, preferably not narrower than 40-50°. 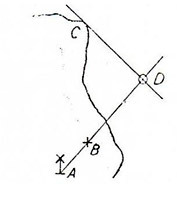 Example of a cross bearing is shown on the image here above where the bearing is taken on the locations of A and B. 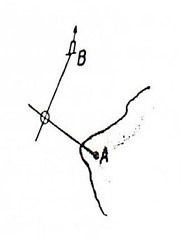 The intersection of the position lines is the location of the vessel.